← June – walking down a path…into the light! 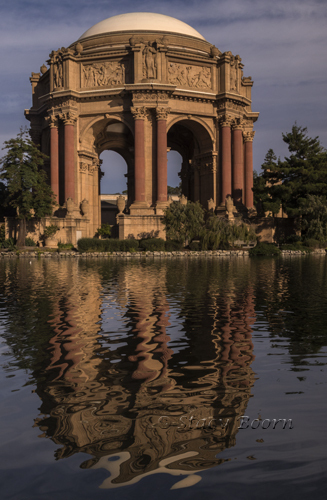 San Francisco’s Palace of Fine Arts is a stunning historic landmark. Modeled after classic Greco-Roman architecture, the palace was built as a temporary structure for the 1915 Pan-American Exhibition. It stood for decades until it was reconstructed with more permanent materials in 1967. In addition, the landscape around it is breathtaking in its beauty, showcasing a wonderful variety of plant and animal life. I am especially moved by the gorgeous swans that make the palace pond their home. Blanche and her mate, Blue Boy, are bouncing back after a string of tragic events over the past several years. In mid-May they had four chicks. I visited the swimming fur-balls within days of their hatching, but, even by then, there were only three. 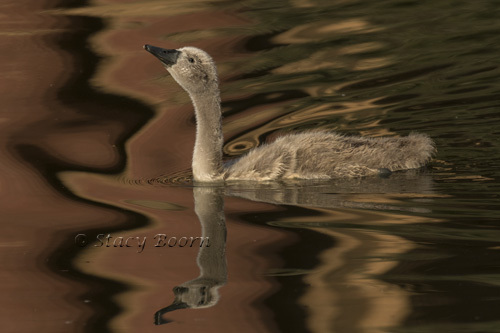 Most likely the first “swanling” (cygnet) to go missing was the victim of other animals. Swan caretakers say that the tiny creature may have become a meal for a snapping turtle, big-mouth bass or owl. Last week just one swanling, now a hardy juvenile, was still swimming with its parents. Volunteers on the palace grounds say that, while the disappearance of the chicks was sad, the young ones would probably have been killed by their father come mating time. Despite all this drama, the beauty and lure of the swans are still very empowering. Swans represent grace and beauty on many levels. They are associated with love, poetry and music. In Roman mythology swans are sacred to Venus, the love goddess; in the Greek tradition they are often pictured singing to the accompaniment of a lyre. For the Celtic people, the swan represented the soul, our eternal essence. Swan’s Wisdom includes awakening the power of self, balance, grace, and creative inner beauty. She offers this wisdom to us all! Taking a ride on mama-swan! The Ugly Duckling is a widely-known children’s story about an obviously odd little duckling. 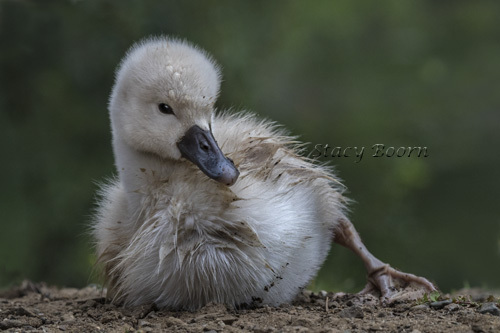 This “ugly duckling” doesn’t look like her brothers and sisters and is rejected and labeled a misfit. In the end, however, all are surprised when she grows into being the most elegant of birds, the swan. The story reminds us that true beauty grows from within, that each of us has inner grace and beauty, and that awareness of our inner beauty nurtures our self-esteem. Further, as we come to appreciate our own true beauty, we gain confidence to venture into new realms and tap into new inner powers. Swans show us how to be confident in our intrinsic power and beauty. When we appropriate this grace, we are able to see and nurture the inner beauty in others. The grace of Swan-Wisdom helps us live a balanced life and enables us to be at home on many planes of reality, to see that we each are more than we appear to be – we are equally physical and spiritual beings. Both are sacred and interdependent. 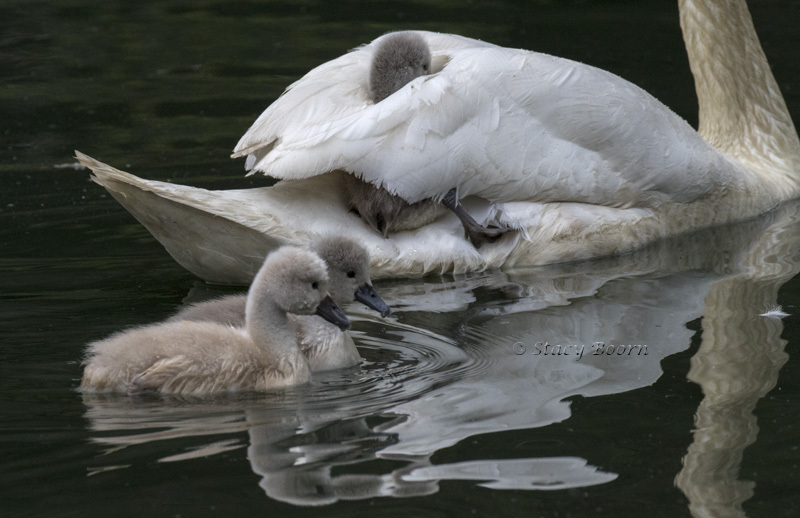 This entry was posted in Weekly 2 and tagged Place of Fine Arts, Stacy Boorn, Swan wisdom, swanling, swans. Bookmark the permalink.